In presenting the administration’s tax plan at a White House press briefing on Wednesday, Trump’s top economic advisers, Gary Cohn (net worth $610 million) and Steven Mnuchin ($500 million), both former Goldman Sachs bankers, could barely contain their glee over the prospect of a massive transfer of wealth to themselves and their fellow oligarchs. The “really big something,” as the one-page handout to reporters made clear, is a plundering operation that will shift trillions of dollars from the federal Treasury to the bank accounts of the rich and the super-rich. The aim, besides adding to the obscene wealth of the financial aristocracy, is to starve and eventually eliminate basic social programs such as Medicare and Social Security. • Reducing the top income tax rate from 39.6 percent to 35 percent. The administration is also proposing to eliminate the taxation of profits made by US-based corporations outside the country, along with a one-time tax incentive for corporations to repatriate trillions of dollars in profits held in offshore accounts. The corporate-financial elite is particularly fixated on abolishing the estate tax. This is because it wants to nail down for its great grandkids everything it has stolen in the past. This tax on inherited wealth, established in 1916, has been repeatedly watered down, but the billionaire parasites want it wiped off the books to establish themselves as an American royalty. Trump and his Goldman Sachs advisers are resorting to shameless lying to promote the tax scheme. Mnuchin, who appeared on the three network morning news programs on Thursday, insisted that the tax plan will benefit working and middle-class people, not the rich. He also repeated the ridiculous claim that the multitrillion-dollar cost of the plan will not increase the federal debt because it will pay for itself through increased economic growth. An independent analysis of Trump’s campaign tax plan, similar to the proposal presented Wednesday, estimated that it would raise the federal debt by an additional $7 trillion in the first decade and $21 trillion by 2036. The massive transfer of wealth will not go to investment, but to acquiring bigger diamonds; more luxurious mansions, yachts and private jets; new private islands; more security guards and better-protected gated communities to segregate the financial nobility from the masses whom they despise and fear. A portion of the money stolen from the working class will be used to buy more politicians and reporters to keep the democratic façade going. The official “debate” on the tax scheme will be nothing more than a smokescreen for implementing virtually all the tax proposals. The Democrats are no less the lackeys of Wall Street than Trump and the Republicans. The Obama White House proposed a cut in the corporate tax rate to 28 percent and repeatedly granted tax breaks to big business as the centerpiece of its phony “jobs” programs. Even as the Trump administration was rolling out its tax plan, it was reported that Obama, following in the footsteps of the Clintons, had agreed to speak at a Wall Street event in return for $400,000 fee. Payment for services rendered. It is nearly half a century since the Democratic Party abandoned any policy of social reform, which it adopted under the pressure of mass struggles of the working class. 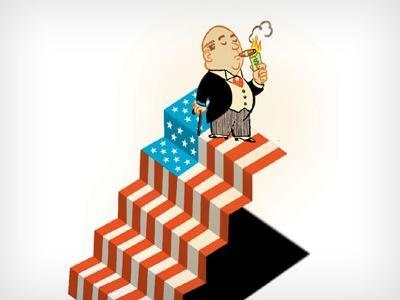 The increasing concentration of wealth in the hands of the rich, abetted by changes in the tax structure, has been underway for decades, carried out by Democratic-controlled Congresses and Democratic as well as Republican administrations. As a result, the corporate tax accounted for just 10.6 percent of the federal government’s revenue in 2015, down from a third in the 1950s. Today, two-thirds of active corporations pay no corporate tax. Large profitable corporations pay an average rate of 14 percent, and some of the biggest companies pay nothing. The Trump administration marks the emergence of government of, by and for the oligarchy in the purest form. But Trump is no aberration and he did not emerge from outer space. He is the noxious outcome of decades of social counterrevolution. Obama handed to Trump a country in which the annual income of the top 1 percent ($1.3 million) is more than three times what it was in the 1980s, while the pre-tax income of the bottom 50 percent ($16,000) has not changed in real terms. The share of national income going to the top 1 percent rose from 12 percent to 20 percent over that period, while that of the bottom 50 percent fell from 20 percent to 12 percent. In human terms, this translates into a society wracked by social crisis and vast suffering, with tens of millions unemployed or consigned to poverty-wage, part-time jobs, life expectancy declining, and drug abuse and suicide rates soaring. Entire generations of young people are condemned to lives of economic insecurity, forced to live with their parents and postpone getting married or having children. The elderly face the destruction of their health and retirement benefits. And all of this to sustain the meaningless and corrupt lives of a small elite of financial parasites! With the people of America and the world facing ever worsening social conditions and the looming threat of world war, the top priority of the political establishment is to hand over trillions more to the wealthy elite. This shows that no social problem can be tackled without directly confronting the oligarchy, breaking its power and seizing its wealth so that it can be used to meet social needs. The American oligarchy, steeped in criminality and parasitism, can produce only a government of war, social reaction and repression. In its blind avarice, it is creating the conditions for unprecedented social upheavals. It is hurtling toward its own revolutionary demise at the hands of the working class.